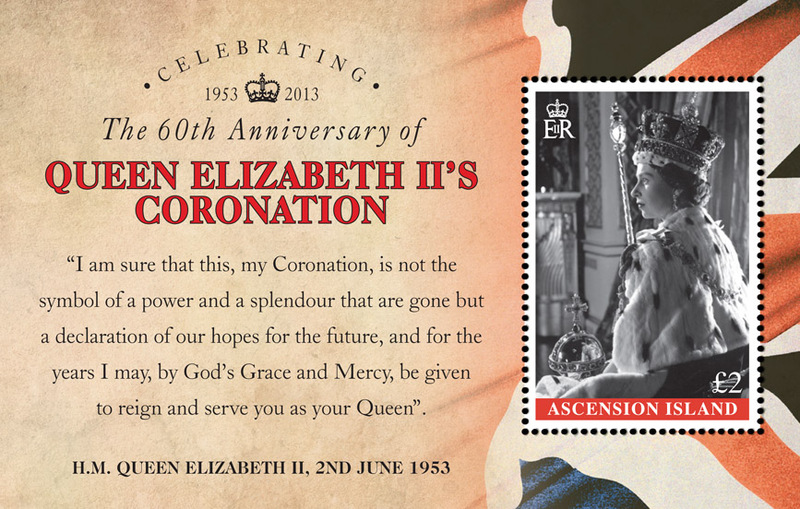 Following on from the issue commemorating the 60th Anniversary of the Accession of Her Majesty Queen Elizabeth II in 2012 and taking note of the excitement that surrounded the celebrations, the Ascension Island Post Office is now releasing a very special series of stamps to celebrate the next milestone in Her Majesty's life which is the 60th Anniversary of the Coronation. Queen Elizabeth II was crowned in Westminster Abbey on 2nd June 1953 as Monarch of Great Britain, Ireland and the British Dominions beyond the seas and has been seen as a steady hand in an ever changing world during these last 60 years. Life has become so much faster with new developments in technology and social interaction and it is remarkable how Her Majesty has changed with the times whilst still gaining the respect and appreciation of the public at large. There will be a set of five new stamps depicting commemorative items and packaging released during the reigns of Victoria (45p), Edward VII (50p), George V (70p), George VI (£1.10p) and Elizabeth II (£1.25p) all based on images supplied by Robert Opie. The five stamps are produced in sheetlets of eight stamps with a label and a decorative border also showing a number of contemporary examples taken from the Robert Opie Collection. 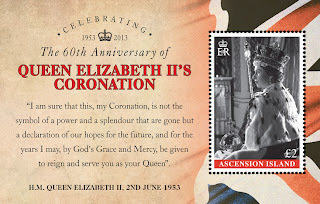 In addition, there is a souvenir sheet containing a single £2 stamp bearing a Coronation portrait of Queen Elizabeth II holding the Orb and Sceptre.